The Sweptail buyer, described in a Rolls-Royce press release as a “connoisseur and collector of distinctive, one-off items including super-yachts and private aircraft”—like all of us, of course—went to the company and asked for a car inspired by the Rolls-Royces of the 1920s and 1930s. 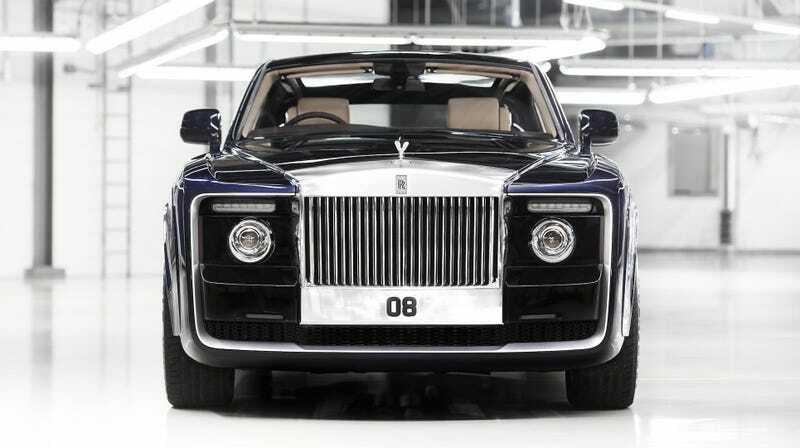 The Telegraph reports that the car cost around £10 million, or just over $12.8 million at current exchange rates. The outlet also reports that it’s the most expensive new car—forget about auctions or privately sold cars—ever sold, which would sound about right since the average Bugatti Chiron slots in at just under $3 million. But remember that if you have the money, a manufacturer will do just about anything for you. Dip your expensive, performance-oriented supercar in solid gold, if you want. McLaren even offers “almost limitless customization” on its 720S, except for T-tops. You won’t get any of those. We may not ever know how much the Sweptail cost its owner, but we do know what it looks like: sort of like wagon with a deflated back end, which is a little strange—but, then again, we humans will think anything is strange to make ourselves feel better about not being able to afford even a small fraction of it. Below are some photos and a video of the car, so you can feel thoroughly poor and unworthy on this fine Saturday. Enjoy yourselves. Rolls-Royce made no mention of whether the client or designers remembered to include its famous umbrellas in the reported $12.8-million design, but surely he’d be able to afford a couple of them if not.